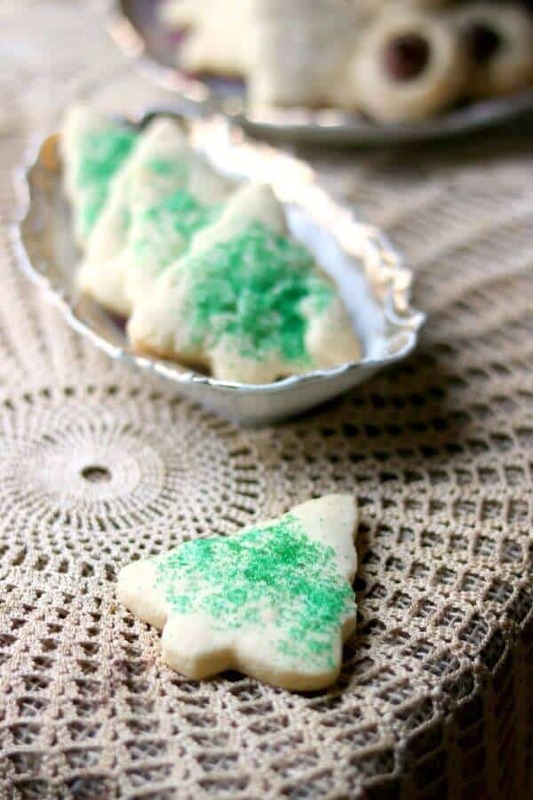 You’ll love this easy sugar cookie recipe! They are literally the best sugar cookies ever — especially if you are baking with kids. You can re-roll the dough as much as you need to without them getting tough, and they are full of a buttery-sugary-deliciousness that makes them perfect for cutting out and decorating. These cookies stay soft, don’t crumble, and don’t spread in the oven. Perfect cookies every single time! This recipe has been updated from the original December 2007 version in order to provide a better experience for our readers. Last updated November 2018. 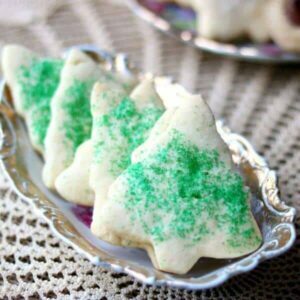 I’ve been making this easy sugar cookie recipe for probably 30 years. I got the original from someone at a church we used to attend who had gotten it from her mother-in-law. We used to use it for the various bake sales that we held because the kids could smash this dough, roll it, re-roll it, and cut it out over and over but it always came out perfectly tender and buttery good. It was definitely a selling point to say that the kids done all of the work! I’m telling you, this is the best sugar cookie recipe ever. You won’t even need a mixer! The butter is melted and everything else is just stirred right in. I don’t think it would be a holiday for my kids without a few of these – especially my older kids who have fond memories of the bake sales. The dough keeps for several days in the refrigerator or you can freeze it for longer storage. Personally, I like to cut the dough out in shapes then freeze the it unbaked. That way I only have to put them on the cookie sheet and bake – no mess and hardly any time at all! These easy sugar cookies start with a very soft dough. Refrigerate overnight or freeze for about 30 minutes before rolling. 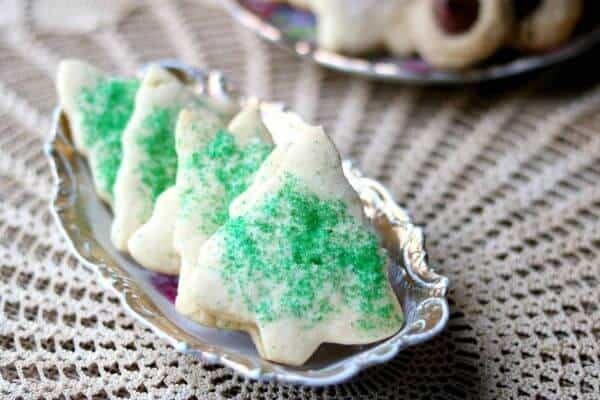 Tips for Making These Easy Sugar Cookies! The dough is very soft – let it sit in the refrigerator overnight or, if you are in a hurry, pop it in the freezer for 30 minutes to an hour. Use enough flour to keep them from sticking. Bake these easy sugar cookies just until the bottoms and edges are light golden brown. 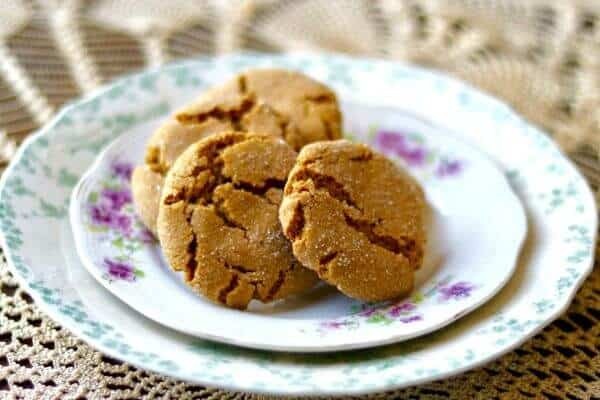 Use baking soda for soft cookies or baking powder for crunchy cookies. 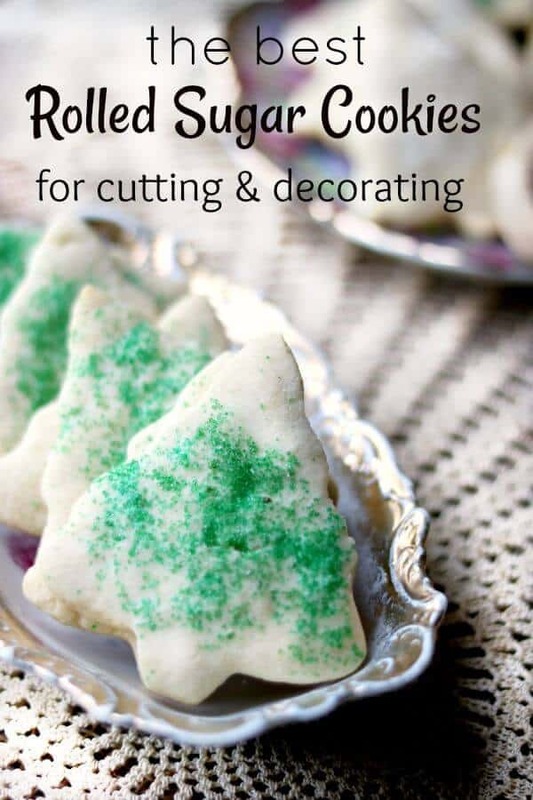 Keep your cookie cutters as close together as possible when cutting. Each time you reroll the dough the cookies get a little less tender. Always bake similar sized cookies together so that they bake evenly. Rolling the dough about 1/8-inch thick will give you a crispy sugar cookie while rolling the dough 1/4-inch will keep them softer. I like to beat 1 egg yolk with 1 teaspoon of milk and brush it on the cut out cookies. It helps the sugar stick AND it gives them a pretty color when they’re baked. 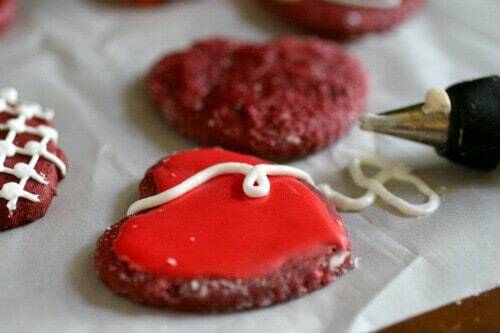 Let cool completely before decorating with icing. Easy sugar cookie recipe freezes well, too. The dough is so easy to work with – there’s no need for a mixer! It goes together with just a spoon. How do you get sugar cookies to keep their shape? This dough almost always keeps its shape perfectly but if you want to make absolutely sure the sugar cookies will keep their shape then put the cookie sheet with the cut cookies on it in the freezer for 10 to 15 minutes before baking. How thick are sugar cookies supposed to be? Good question! That kinda depends on you. 1/8th to 1/4- inch thick is about right. 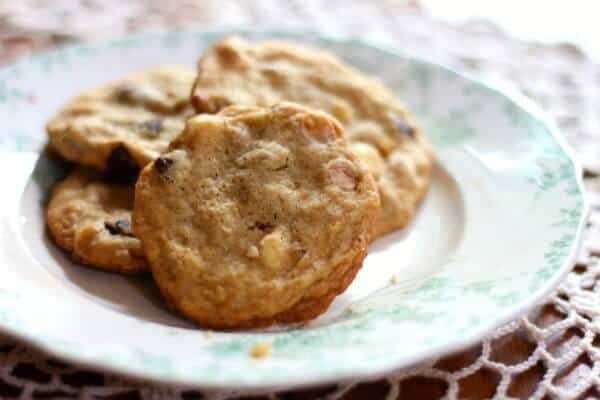 Thicker cookies, especially when made with baking soda, stay softer. Thinner cookies, especially when made with baking powder, stay crispy. How long do you let the sugar cookies cool before icing? Let them cool completely so that they are not warm to the touch or the icing will melt off. The actual time can vary, depending on how cold your kitchen is. Shoot for 30 minutes to an hour to be safe. Do you decorate sugar cookies before or after they’re baked? If you are using colored sugar and/or sprinkles then they go on the cookie before baking. If you are using icing then you need to wait until the cookies are baked and cooled. If you’re having trouble getting the sugar/sprinkles to stick on the unbaked cookie simply brush the surface lightly with a little egg beaten with milk. Why did my sugar cookies spread out? You’re oven was too hot and the butter melted too fast. Be sure your oven is at the correct temperature. Freezing the cookies before baking will help, too. Sugar cookies are so pretty in a holiday cookie assortment. Good cookie sheets make all the difference in the texture of your cookies and whether or not the bottoms burn. I like these heavy duty cookie sheets from Calphalon for this easy sugar cookies recipe. They’re high quality and will last for years. Have you ever made chocolate cutout cookies like these Chocolate Cutout Halloween Cookies from House of Nash Eats? 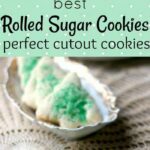 This recipe makes easy rolled sugar cookies for your Christmas cookie tray but they are beautiful for any occasion from Valentine’s Day to Halloween. Cut them in around and put two together with some chocolate ganache in between for sandwich cookies – so good! They travel well so they’re great for back to school, too. 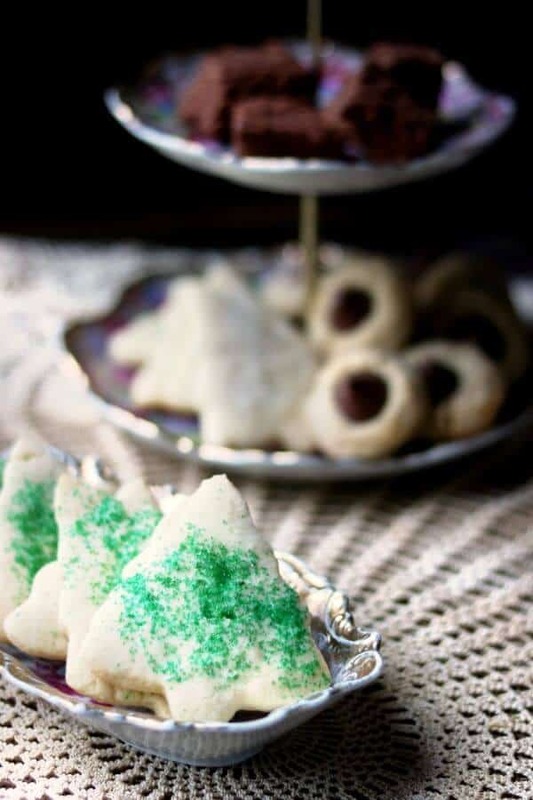 I can’t imagine Christmas without these cookies and my family fruitcake recipe! If you love this recipe please consider giving it a 5 star rating. Thanks! 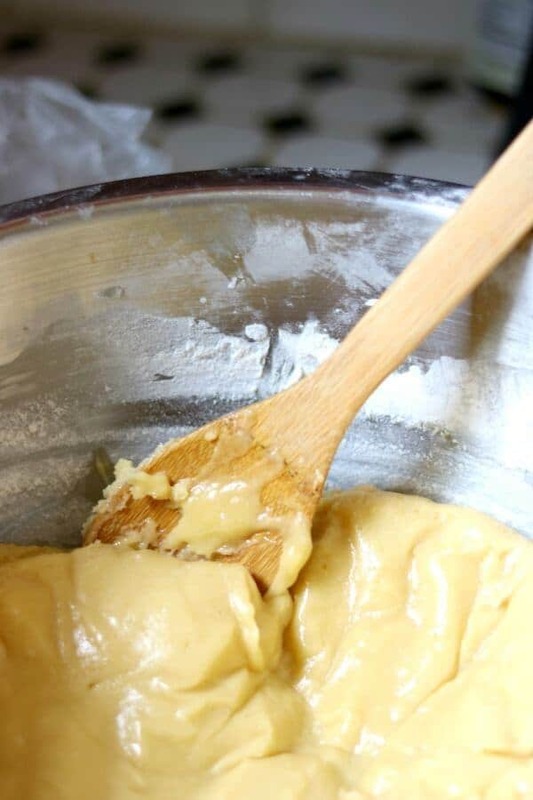 Easy, buttery sugar cookie recipe that comes out just right every time. These freeze well and are the best rolled sugar cookies you'll ever try. Whisk the sugar into the melted butter and let it stand until the mixture is lukewarm. 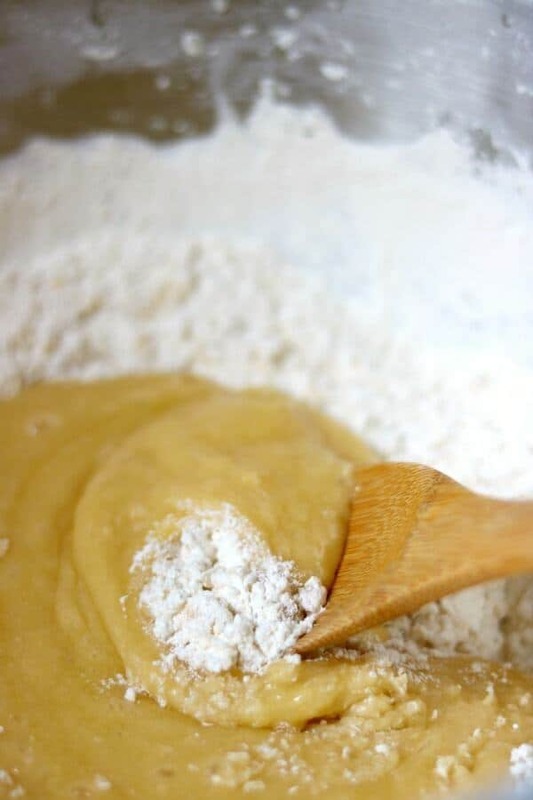 Mix the flour, salt, and baking powder. Chill in the freezer for 30 minutes or the refrigerator overnight. Roll 1/8 inch thick on a lightly floured surface. Cookies should be golden on edges but don’t let them brown. Amount varies with size of cookie cutters. Hi there! Looks like a great recipe! I was reading the article and didn’t see anything specifically pertaining to freezing the recipe and using it later down the road. I’m going to be making Christmas cookie plates for friends and family this year so I just wanted to make this ahead of time. Thanks for your time! April’s making your cookies again….she said to tell you that you are too young to be a grandma and she loves that you love RED. (She does, too) My baker2be is off making cookies tonight for her birthday tomorrow. 🙂 Have a great one, my friend!